Jo Bailey was a mystic and religious figure who, shortly before his death, founded the Church of Jo. A late 20th Century historical novel by award winning author Bryan Costales. The life and times of Jo Bailey is presented in the form of a sequence of letters, articles, news accounts, diaries, and so on, each told by someone who cared about, or hated, Jo. It is the combined nature of these narratives that provide a rich overview of the last part of the 20th Century and and of Jo Bailey's ability to foresee death, but never prevent it. This book is a fiction in the guise of reality, a story about the last half of the 20th century, and about three solved mysteries. What might happen to a man who could foresee but not prevent death? That was the question I sought to answer in my novel Jo. I examined his confused youth; the father that beat him; and the mother that used a charlaton to vent spirits from his skull. At one point, Jo wrongly believed that repair of that hole in his head might remove his power. He discovered that he could make money with his skill, but felt guilt at the unforseen deaths that resulted. 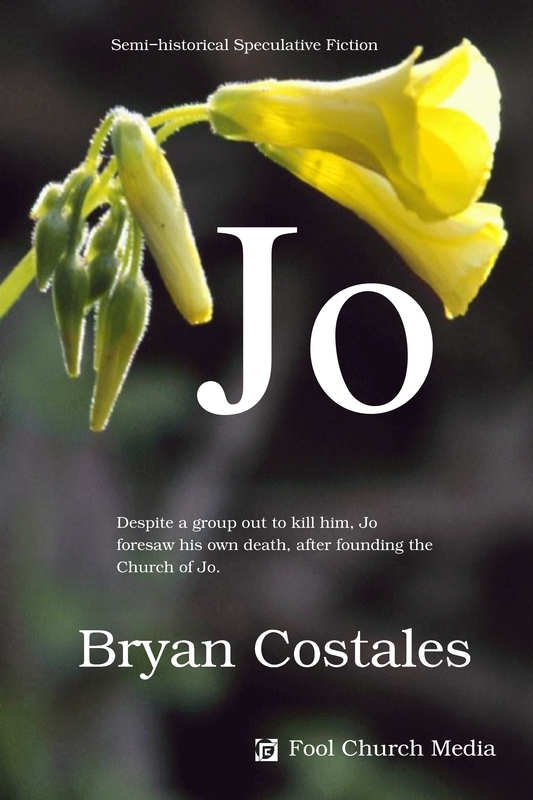 His guilt finally led him to found a church, the Church Of Jo. Jo's life is told by the people that knew him. Each person's story is both about Jo, and about the person telling the story. It is this indirection that enabled me to reveal the later part of the 20th Century; from old PG&E camps to the Berkeley Free Speech Movement; from the Viet Nam War to life in the Mojave Desert; from the Philipines to his death in Wyoming. I was surprised Jo remembered me. After that party in `68 it was like he had vanished from the surface of the Earth. We'd had a fling on a mattress on the top floor of that big house in Berkeley that smelled like burned popcorn. He was gone when I woke up with a terrible hangover. A month later I found out I was pregnant. His kid, I'm sure. I couldn't keep the baby. My folks wouldn't let me. My dad was okay but my mom was furious. So I gave birth in a hospital in Berkeley, kept my daughter for a month then finally had to give her up for adoption. A girl, my daughter. I named her Joy because that name started with J O for Jo. Last night I met Jo at an art opening in Pasadena. I took over an hour to get there by city bus. The second bus didn't think I had a good transfer but I begged and he let me on anyway. The art place was on a corner across from a park. I must have gotten there early because the big room wasn't crowded. I felt under-dressed in a clean blouse and my twice taken in and once mended gray dress slacks, still too big, held up with a belt, but I figured, what the heck, I'd been invited. I knew Jo at once because of all the times he's shown up in the news. His hair was longer, of course, but still brown. And he wore a suit. I didn't expect that. Hi, he said to me. You look too thin. Hi, I said to him and say no I'm still too chubby. I know you, he said. He looked me up and down. Then he said, You're from Berkeley. You're Dahlia. Not that exactly, of course. But something like that. Yeah, I said to him. Then I asked him if he was there to look at the art? Course I wasn't there for the art myself, I told him, I was there for the free cheese and fruit plates. Jo said, he was there because the artist made art from his books. I wish I could talk like Jo. He actually said words prettier than that. But I don't remember exactly how. All these years I wanted to tell Jo about the baby, but when the time came I wasn't so sure at all. I wondered if I should tell him proud or blame him or maybe say it matter of fact. I must have thought about my words too long because he got a look on his face like he expected me to say something. So I blurted everything out. I told Jo he had a daughter and that seemed to surprise him. Maybe shocked is closer. His eyes went wide and he stared at me. Then he calmed down and patted my arm. A warm pat, sure, but still just a pat. Let's meet for lunch tomorrow, he said. He suggested that new Mexican place on Hollywood Boulevard. That was okay with me, so we made, well, a date. Jo said something to the lady in charge of the art show. She wore a black dress that looked like it cost more money than I got in welfare in a year. She filled a bag, an actual cloth bag, with the most yummy stuff you ever ate and let me take everything home. The bag was empty and my stomach full by the time I got home on the bus. Made me sick though, I threw up all the good food. The bag was a nice cloth though, maybe for me to store old clothes. My Sunday Lunch with Jo, June 6 maybe? I think he chose that place on Hollywood Boulevard because of that big fountain in the back with all the tables. You can talk there and nobody can hear you because of the water noise from the fountain, real private. Lot's of stars are supposed to eat there, or that's what they tell you. I believe because of all the famous photos on the walls. Jo paid for lunch. He had a big wad of twenties in his pocket. Weird, you know, because he dressed so poor all the time in his pictures. He wore blue jeans and a sweat shirt for lunch, not the suit he wore at the art show. I don't think the place wanted to let him in, but they believed he was famous so they did. A heavy set man sat at the table next to us. I figured he was there to protect Jo. The man would watch everyone that came by. Even the waiters. I think he had a gun bulge under his sport coat. He dressed better than Jo too. Jo asked about his daughter. Our daughter, I guess, but I was the one who gave her up. He wanted to know how to find her. I told him that he couldn't because those records were sealed. I'll find her he told me. He seemed really certain. But I didn't think he could. I asked him if he could really listen to the dead? No, he told me. I visit the memories of the dead, in the next life after you die and are reborn. I asked him how that was different. When you die, he said. You come back again but you're different. Maybe you're born from somebody else or you're a boy and not a girl. You live the beginning over again, but a little different. And those memories are not really memories, you know. More like you're reborn into another someplace else, I think he used the word dimension. His talk made my head spin so I fingered the edge of the table cloth for something to hang onto. A simple stitch made by a machine, straight and even; made me feel calm, that stitch under my fingers. The waiter came by then and asked if we wanted drinks. I ordered a strawberry daiquiri. Jo didn't order a drink. I looked up and smiled. He waited for me. I can't kiss you if you drink that, he said. I asked him why, don't you like drunks? He smiled. You know, he said. I'm allergic to strawberries. I'd forgotten. Or maybe I never knew. I mean we'd only been together one night. I couldn't think of anything to say to that. So he told me about his mom. She was killed when he was a little boy. She was shot when she came home and found someone robbing the place. I couldn't save her, he says. Naturally I think of the crazy guy with a blanket for a cape. How he said he could save me. But then Jo said, in her next life, the one that she lived again after she died, his mom never got married. I asked him how he could tell if he visited someone reborn. You can't, he told me. You and me might be reborn. And not only that, you can be reborn over and over again. And each time you change a little or a lot. I was confused, of course, but I wanted to look like I understood. I struggled. I held onto the table cloth with my right hand, held and twisted. I asked him how he knew his mother didn't get shot in her next life? I visit her, he said. Then he surprised me. He asked, You want me to show you? I said sure but I wasn't sure. Jo leaned back and closed his eyes. The bodyguard shook his head, like he'd seen Jo do this before. I expected maybe a seance. You know, he would speak in a spooky voice like some dead guy. But no. He talked in his own voice. Calm like. Like he was really there. I'll try to write down all his words, but I'm sure I'll miss some. He said, My mom's in a grocery store. She's picks up oranges and hefts each in her hand. She puts some back. She puts some in a bag. Man I wish I could talk like Jo. Sure I try to write down what I hear him say but everything comes out like my words. I don't have his words. But I gotta write something because I think what he told me is important. Then he says, his mom doesn't recognize him of course, because in the next life she only had a daughter. She has no wedding ring on her finger. Jo says, She is younger than me, of course, because she died when I was in grammar school. So her memory, her new birth, started when I was already eight years old. Hi ma'am, Jo says to her. Hi, she says to him. Jo asks, can I ask why you weigh each oranges? Sure, the woman, his mother says. Jo says, I like her smile. My mom was really pretty when she was younger. His mother says, I weigh each one in my hand. The heavy ones have more juice. Usually the ones with the smooth skin have the most juice, but not all the time. Even though his voice is there the whole time, I can tell when he talks and when his mom is talks. You would think, he tells me. He talked to me as himself again and that surprised me. He said, That if your whole life memory is there when you die, your whole life memory would exist in your next life. I can visit the past memories of my dead mom, but not the future ones. Because she hasn't lived them yet. The waiter came then and set down my drink. I thought I shouldn't drink, but I did anyway. Jo let me order anything I wanted. I ordered the salad because of the walnuts. I wanted a tamale but I was watching my weight. Jo didn't order because he said he had a meeting. He waited until I got my food then paid and left. God, I've been writing for hours. Amazing. I guess, easier to write when I actually did something. Go figure. That following weekend Mr. Scallody sent three of the guys out to the Mojave to take care of Jo Bailey. Larry drove and Frank King took the rifle. Sam Datworthy went along to do anything that required strength. I stayed behind with Mr. Scallody and the other two. The next day Mr. Scallody called us three together to tell us he had to run into L.A for the day. "If anyone comes around asking," he said. "Tell them I'll be back tonight." But he never came back. The three guys from the Desert came back two days later, Larry driving of course. But Mr. Scallody never came back. We talked Larry into a drive down to L.A. to find out what happened. He came back that night and told us Mr. Scallody got himself shot and killed in a bar. Seven guys with no boss shared cots in a warehouse by the train tracks in nowheresville. Naturally tempers flared. I personally broke up three fist fights. And the place started to stink. At the insistence of Evan Datworthy, we broke into Mr. Scallody's office and divided up the money we found there. Enough for all of us to get a fresh start. George Wriggles objected to an even split because he thought the Datworthy brothers should share a split. I pointed out that the brothers were totally different and did everything separately, so they should get one split each. That seemed to settle the matter. I telephoned Father Desmond who acted pleased to hear from me. He reminded me he had only dropped me off four months earlier. I told him that Defoe Scallody had been killed and ask if he could pick me up and give me my job back. "I don't like that Defoe bunch," I told him. "They're all killers at heart." "I'm sorry to hear that," he told me. "Of course. I would be delighted to have you back. I will pick you up tomorrow if that is okay?" I told him, "Yes please," hung up, then went to find the other guys to find out what their plans were. I could only find George and Larry. Frank and the Datworthy brothers had already left. "Where did they go?" I asked Larry the driver. "The brothers got greedy," he said, and spit at the ground. "They said they planned to kidnap Jo Bailey for money. Them and that fool Frank after his fuckup in the Mojave." "Did they tell you what they planned?" George had stuffed his large duffle bag into the trunk of Larry's car. He wiped his hands on his pants and said, "If you can believe the brothers. Bigger liars than I've ever seen in my life." Larry added, "They intended to hold him in an abandoned silver mine. Don't know where, but Evan said their dad left them ownership of one. I can't rightly say that's true or not." He shrugged. Larry and George packed the car and drove off. Larry's parting words were, "Don't take any wooden nickels." I waved and called, "I wooden think of it." Larry and George laughed. I watched their car pull to the road and turn right, and then it was gone. That left me the afternoon to kill. I cleaned up the warehouse the best I could. I couldn't find a broom so I didn't sweep. But I did haul out all the trash and broke down and stacked all but one cot. I found a crowbar in a corner by the small bathroom. I broke into the office with all the news clips on the walls. That office was the one with a broom. That figures. As long as I was in there I decided to pull down and throw away all the documentation. As I pulled each down I read as much as I could. Mr. Scallody had been sloppy. I found dozens upon dozens of documents that were about other people but that had been folded or cut to mask that fact. I quickly found a pattern to his lies and deception. The papers covering the walls fell like a house of cards. Marked cards I felt, used to cheat me. I packed the trash in bags. I managed to dodged a bullet. If Mr. Scallody had not died I might have been convinced to do something terrible. After the walls were clean I rifled the drawers and found more money. A quarter of a million all total, in envelopes and paper bags. I said to the room, "You were well financed, weren't you?" Too late I realized I should have left the papers on the wall to show Father Desmond. "Oh well," I said. "He'll have to be happy with a big donation to the church." And that made me smile. I worked again as a gardener for a whole year. During that time I bought and read both of Jo Bailey's books. I was impressed by his willingness to test his theories. His books had a scientific slant to religion I hadn't seen before. I tried to talk to Father Desmond about the books but he became furious and lumped Jo Bailey with Scientology and Satanism as fringe religions intended to steer the gullible away from belief in the true God. I kept my thoughts about religion to myself after that and only talked with Father Desmond about his religion and my love of puzzles. That was a combination Father Desmond enjoyed. One day Father Desmond revealed to me he had enjoyed chess as a boy. We began to play chess on Saturdays. Over these leisurely games he would posit his thoughts to me in the form of questions like, "If there was no Hell and only a Heaven, what would prevent the spread of evil in the world?" Father Desmond had a sneaky streak too. As a gift he got me a book of Bible crossword puzzles. That way I was forced to study the Bible in order to solve the puzzles. After a year I began to feel like a permanent employee of the church. Unfortunately that was when news finally broke that Jo Bailey had been kidnapped. Father Desmond knew everything about what he called the "Scallody embarrassment." He found me in the garden. He carried a newspaper in his hand and a stern look on his face. "Ace," he said. "You have to contact the FBI with what you know. I know all that happened over a year ago, but your information may still be important." I did and the FBI arrested me as a material witness. Father Desmond tried to prevent them from handcuffing me but failed. He asked them to wait as they loaded me into the back of a car. Father Desmond ran back into the church and emerged seconds later. "I had hoped to give you these for your birthday, but I suppose ahead of time will have to do." He handed me four books through the car window. The books were bound with a simple purple ribbon. "What are they?" I asked. I held them on top of my lap with my handcuffed hands. "The holy Bible, of course. A brand new book of crosswords for your birthday and the two Jo Bailey books I found hidden in your room." He said, with a wink. "I figure can't hurt you to hear the horse's mouth." "Thank you for everything," I told him. "You've been like the Dad I never had." Father Desmond smiled, but like he was embarrassed. I told him, "Don't take and wooden nickels." He laughed and said, "I won't."